Abbey Whitehead of Mountain View performs her beam routine during a Region 5D competition at North Stafford High School on Saturday, Feb. 9, 2019. Zara Christophe of Mountain View takes to the air in the balance beam competition during a Region 5D meet at North Stafford High School on Saturday, Feb. 9, 2019. 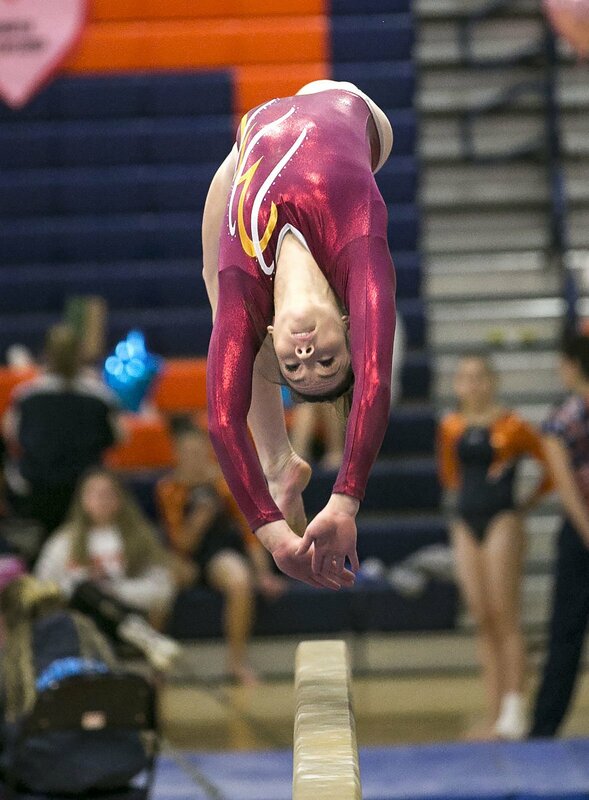 Stafford’s Sophia Housand finishes off her beam routine during Saturday’s Region 5D meet. Laney Krejdovsky of Stafford High School performs her floor routine during a Region 5D meet at North Stafford High School on Saturday, Feb. 9, 2019. Christina Beggs performs her floor routine during a Region 5D competition at North Stafford High School on Saturday, Feb. 9, 2019. Christina Bapple of North Stafford placed first overall in a Region 5D competition at North Stafford High School on Saturday, Feb. 9, 2019. The Wolverines’ Christina Bapple placed first in all-around at the 5D meet. In Shawn Thurston’s 20 seasons as head gymnastics coach at Stafford High School, floor exercise and balance beam have been traditional strengths for the Indians. The same held true on Saturday, as the Indians rode the two events to the Region 5D crown at North Stafford High School. It was the eighth such title in her illustrious career. All five Stafford gymnasts scored 9.25 or higher on floor, helping the Indians to a team-best 38 points on the event. Their routines went just as smoothly on beam for a 36.525 tally. The host Wolverines were the closest challengers on the apparatus with 31.775. Beggs registered a meet-high 9.75 score to capture the floor title. Stafford will compete in the team portion of the state meet next Friday at Salem High School in Virginia Beach. Defending state champion Freedom is viewed as the top challenger. Individuals finishing in the top four per event and the top two all-arounds qualify for Saturday’s individual competition. In the all-around competition, Housand could not repeat the title she won at the Stafford County championships, getting edged out by North Stafford’s Christina Bapple, 37.475 to 37.450. Although missing out in the all-around advancement, Abbey Whitehead and Zara Christophe were the driving force that sparked Mountain View to a second-place finish. Whitehead won on bars (9.45) and shared second place on vault with Christophe. Whitehead, who will be competing for the Rutgers University team next season, has several friends on the Stafford squad and hopes to attend Friday’s team competition. “I love watching her [Whitehead] because she is so good. Really excited when she hits her routines,” said Christophe, who executed a back tuck on the beam to achieve a state qualifying score, besides advancing on vault. Team scores: 1. Stafford 146, 2. Mountain View 138.075, 3. North Stafford 136.975, 4. Harrisonburg 105.825, 5. Brooke Point 104.575. Vault: 1. Christina Bapple (NS) 9.7, 2 (tie). Abbey Whitehead (MV) and Zara Christophe (MV) 9.65, 4. Mackenzie Fox (NS) 9.525, 5. Sophia Housand (S) 9.4, 6. Kaitlyn Biecker (BP) 9.4. Balance beam: 1. Housand (S) 9.6, 2. Kameryn Daniels (S) 9.525, 3. Bapple (NS) 9.225, 4. Christophe (MV) 9.15, 5. Biecker (BP) 8.8, 6 (tie). Keagan Habina (S) and Christina Beggs (S) 8.7. Uneven bars: 1. Whitehead (MV) 9.45, 2. Housand (S) 9.1, 3. Daniels (S) 9.0, 4. Bapple (NS) 8.975, 5. Fox (NS) 8.95, 6. Christophe (MV) 8.9. Floor exercise: 1. Beggs (S) 9.75, 2. Bapple (NS) 9.525, 3 (tie). Laney Krejdovsky and Whitehead (MV) 9.5, 5. Daniels (S) 9.425, 6. Habina (S) 9.325. All-around: 1. Bapple (NS) 37.475, 2. Housand (S) 37.45, 3. Whitehead (MV) 37.35, 4. Christophe (MV) 37.05.